27 October: Dylan Thomas’s Birthday. May each one of us find the child’s key to heaven that opened the gate for Dylan that day when he whispered the truth of his joy. 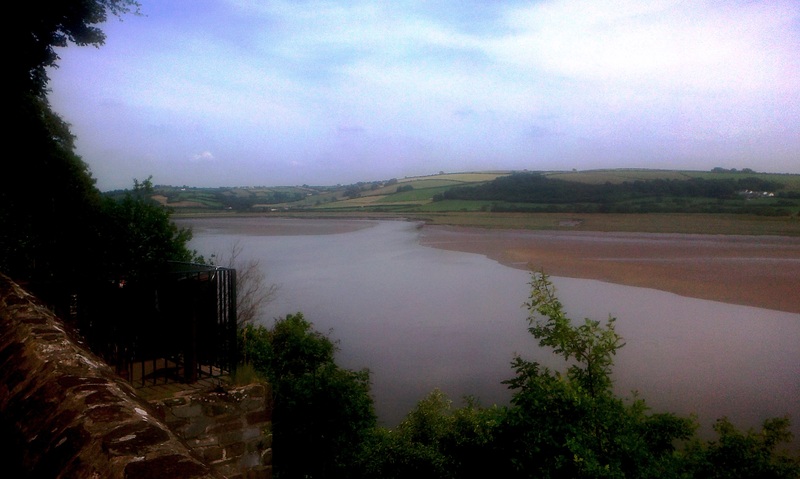 Views of Laugharne, where Dylan walked. This entry was posted in Autumn, poetry, Uncategorized and tagged children, Dylan Thomas, heaven, joy, poetry, treasure in field, trees, Wales, water, wonder on October 27, 2017 by willturnstone. Today is Dylan Day. Despite a swell of opinion that Dylan was not a religious writer, I find the evidence points to a deep spiritual awareness and yearning. Here is a taste of why I see many parallels between him and Augustine. Here are two books written by men in mid-life, although Under Milk Wood would be Dylan’s last work. This is the story of a community of people like him, saints who are sinners, a Welsh City of God, funnier and warmer than Augustine’s version. Sadly we mortals may not yet linger there. Dylan had seen Llareggub builded here, in Wales, the Chosen Land. It is no mean city, although it is little, like Wales, and like Wales, or the Churches of John’s Revelation, it is on earth as it is in heaven. Dylan was nurtured at the same source as Augustiine; if philosophy opened the wells for the bishop, poetry released for the ‘spinning man’ a flood to float his cockleshell ark, and, we may hope that ‘the flood flowers now’ for him, beyond the ‘breakneck of rocks’ of his life. This entry was posted in Uncategorized and tagged Augustine, creation, Dylan Thomas, poetry, Wales on May 14, 2015 by willturnstone. Stream(s) again a wonder of summer. Yes, the year is turning round: these are the last strawberries, said the greengrocer at the Goods Shed, and so, remembering next week’s Harvest Festival, I came home to harvest the more presentable grapes that have not gone to feed the starlings and blackbirds. I was reminded, in this month of the centenary of his birth, of Dylan’s Poem in Autumn, sharing with us his walk through the little town, the weather turning, his mind and heart turning to celebration and prayer, out on the hill. Let us be grateful for the last strawberries, for the grapes and all the harvest and for the birds who bring us pleasure even as we pretend to be cross with their depredations. We’ll be feeding them through the winter! This entry was posted in Uncategorized and tagged Autumn, birds, blackbird, Dylan Thomas, gutter, Laugharne, October, storm, strawberries, thanksgiving, The Goods Shed. on October 5, 2014 by willturnstone. 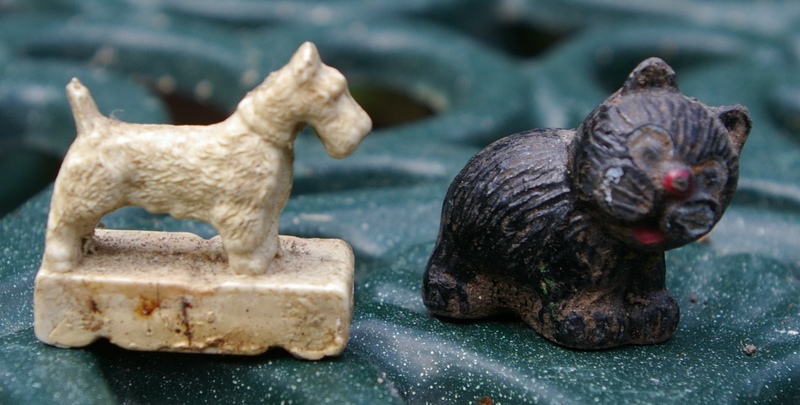 A few weeks ago, digging in the back garden, I turned up a small toy cat, what my daughters used to call a China animal. Friday by Friday, each of them collected a set of dragons, ducks, horses or cats from a tiny shop near where I worked, each animal brought home in its own tiny paper bag. At 10p apiece they provided hours of imaginative play. When the girls saw this relic of their childhood there were gasps of delighted recognition. Delight, but puzzled delight for us when the good people from Regency Floors brought us a white Scottie dog found wedged between the floorboards they were renovating. None of us recognised him: a Monopoly counter perhaps, but not one we had ever played with. At Dylan Thomas’s Boathouse in Laugharne/Llarregub a cabinet displayed half a dozen toys unearthed in the garden, including a Dinky car like one my cousin Anthony used to let me play with. Good to think of those children playing in the garden: the toys a concrete reminder that A Child’s Christmas in Wales would have been blessed, even with little by way of material things, as ours were in Birmingham. Domestic archaeology, unearthing happiness! Dylan praised Laugharne/Llarregub for its smallness in a small land, smiling under the Principality of the Sky. Delight is beyond measure, a tree from a mustard seed. This entry was posted in Uncategorized and tagged A Child's Christmas in Wales, Archaeology, Children's Play, Dylan Thomas, gardening, Laugharne, Llaregub, Lost and Found, Monopoly counters, Regency Floors, Toy Animals. on August 4, 2014 by willturnstone. For his part, Dylan admits the fear that Thompson describes; he acknowledges the fear-bred anger, and flees in an ark of roaring poetry, commandeering for his heart the boat that Noah entrusted to the waters when the flood washed against his home. Fear and anger ­­– such emotions show that a man is alive, that the spring or fountainhead of being bubbles up inside him. Dylan may mock his little town in the very naming of it, but he loves it, seizing the angelic trumpet to celebrate it. And he sees God not through the fog, but in ‘the close and holy darkness’ about the town; a loving presence ‘All through the Night’. We came to Laugharne last week, saw how cramped the Boathouse had been for the poet’s family, how far from tranquil it must have been on a wet winter’s afternoon with the children running bored around his feet. We looked into Dylan’s little writing shed along the path and out through the windows about his writing desk. Here, on a golden summer’s day, it is easy to believe that Wales, including Laugharne-Llaregub, is a tranquil ‘God-built garden’. It smelt of marjoram, mint and salty mud. There was an old television programme showing in the upper room, which dismissed the notion that Dylan’s poetry was religious, but claimed he celebrated life. He did that; indeed he did, but Milk Wood and the Prologue to his collected poems are the religious works of a reluctant saint, trying against himself to be, or not to be, a sinner. Ask St Augustine; ask Kathleen Raine; ask Rowan Williams. This entry was posted in Uncategorized and tagged Augustine of Hippo, Dylan Thomas, Francis Thompson, Kathleen Raine, Laugharne, marjoram, mud, poetry, Rowan Williams, Wales on July 22, 2014 by willturnstone. And all things glad and beautiful. W.H.Davies. Davies gives us a reminder that St David on his deathbed urged the people of Wales to be faithful to the little things; WHD is by no means the only Welsh poet to live up to this command. Dylan celebrated small town life Under Milk Wood. 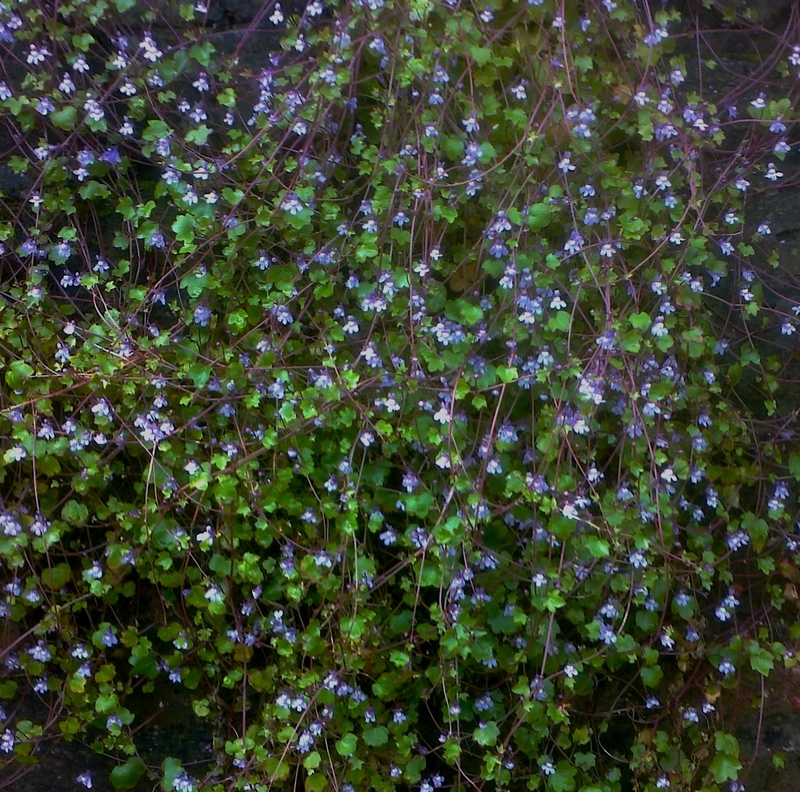 One little thing leapt out at me the other morning: I walked round the corner to find that the back garden wall is a mass of purple wall-toadflax. A few years ago we were at St David’s Cathedral, where the boundary wall carries a thriving colony of a white variety of this beautiful little thing. I hope no zealous tidier-up of unconsidered trifles ever weeds them all away. The Turnstone toadflax can rest easy. Even if Mrs Turnstone does turn her hand to repointing our wall, there will always be a crack for a seed to take root and start the colony again.